Some of the country’s best-loved sweets are suitable for vegetarians, and can be purchased, right here, from our collection of wholesale sweets. From tangy Refreshers to classic Love Hearts and vegetarian Haribo, our collection of wholesale confectionary means your vegetarian customers will never feel left out. With next day delivery available on orders placed before 12PM, it has never been easier to cater for everyone. Imagine the frustration when your friends fill up bags with delicious wholesale confectionary, and all you can do is stand there and watch. Thankfully, our range of vegetarian sweets are free from gelatine and other animal products, so you customers never have to feel green with envy again. Vegetarian customers love sweets as much as the next person, and it has never been easier to cater for special diets. We stock an exciting selection of wholesale vegetarian sweets that your customers will love, from classic confectionary to vegetarian Haribo. If you have any questions about our range of veggie sweets, wholesale penny sweets or other products in our confectionary range, give us a call on 01254 306840. 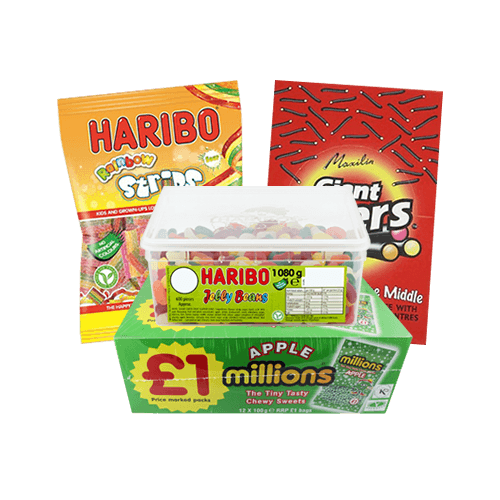 From wholesale Haribo to Millions and Chewits, we stock it all!